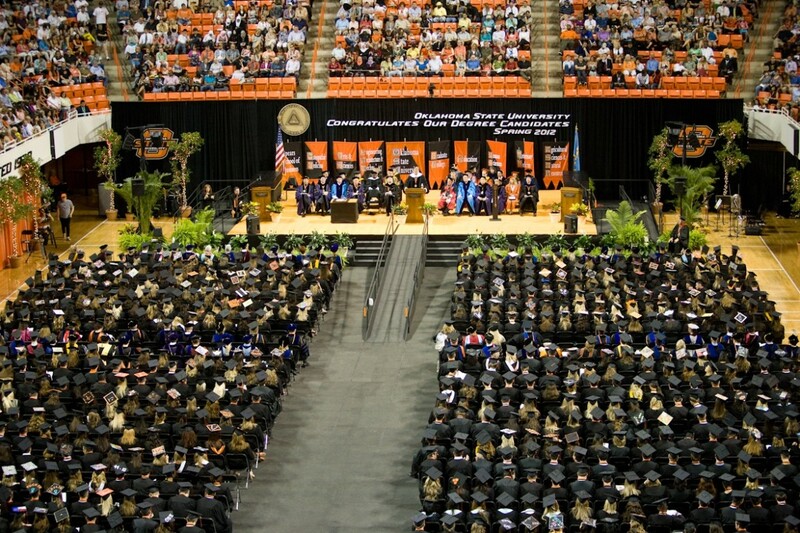 Scene of spring commencement at Oklahoma State University. Higher education funding took a wallop in the state’s budget this year, and one result is that college students can expect tuition and mandatory fees to rise an average of 8.5 percent this coming school year. That will mean tuition and fees have risen by anywhere from about 60 percent to 139 percent over the past decade, depending on the college or university. The state Regents for Higher Education on Thursday approved tuition increases at the state’s 25 public colleges and universities. The cost for undergraduates attending 30 hours will be $8,630 at the University of Oklahoma and $8,320 at Oklahoma State University. The Legislature appropriated $810 million to higher education, a decrease of 16 percent and one of the largest reductions of any agency. Common education was essentially held flat. “Unfortunately, the 16 percent budget cut to higher education will have a negative impact on our institutions’ ability to meet their academic missions,” said Toney Stricklin, chair of the state regents. The tuition and fee increases will replace about a third of the funding, leading colleges and universities to make up the difference by eliminating faculty and staff positions, instituting furloughs and other cost-saving measures. Rep. Richard Morrissette, D-Oklahoma City, has said lawmakers intended the budget reduction to be “direct retribution” against OU President David Boren, who is leading an effort to raise sales tax by 1 percent to infuse revenue into education. The penny sales tax proposal, which is expected to be on the November ballot, includes a guarantee that future Legislatures can’t reduce appropriations to education and allow the sales tax to make up the difference.